There are three essential elements for a combat patrol: security; support; and assault. The size of each element is based on the situation and the analysis of METT-TC. Additional tasks/special purpose teams assigned may include search teams, prisoner teams, demolition teams, breach team, and aid and litter teams. The support element suppresses the enemy on the objective using direct and indirect fires. The support element is a shaping effort that sets conditions for the mission’s decisive effort. This element must be capable, through inherent means or positioning relative to the enemy, of supporting the assault element. The support force can be divided into two or more elements if required. The security element(s) is a shaping force that has three roles. The first role is to isolate the objective from enemy personnel and vehicles attempting to enter the objective area. Their actions range from simply providing early warning, to blocking enemy movement. This element may require several different forces located in various positions. 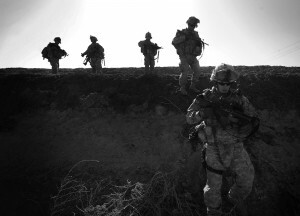 The patrol leader is careful to consider enemy reserves or response forces that, once the engagement begins, will be alerted. The second role of the security element is to prevent enemy from escaping the objective area. The third role is to secure the patrol’s withdrawal route. There is a subtle yet important distinction for the security element. All elements of the patrol are responsible for their own local security. What distinguishes the security element is that they are protecting the entire patrol. The security element is organized to address the primary threat to the patrol—being discovered and defeated by enemy forces prior to execution of actions on the objective. To facilitate the success of the assault element, the security element must fix or block (or at a minimum screen) all enemy security or response forces located on parts of the battlefield away from the raid.